Works with the co-shopper for shopping and assigning prep work. Hosts the cooking in her home. Decide how often you want to meet. My group meets every other month. This way you only have to host once a year. Cathy’s group meets every 6 weeks, so they get more meals to work with! You always co-shop the time before you are the hostess this helps you be aware of what items may be left over from last time. We usually do all of the shopping at Winco and Costco. Although we always check for sales on meat which sometimes requires a trip to Paul’s or Albertsons. Hostess and co-shopper go to purchase all of the food. Shopping can take 2-3 hours. This can be purchased by one person or split if one person can not support a $500-600 charge to their account. We usually have the hostess pay for everything. Keep in mind that when shopping at Costco and Winco, you cannot use a credit card (unless you have an AmEx card at Costco). Make sure you each grab a cart. Shopping for this many meals and people requires a lot of food. The shopping list should include the number of ounces or lbs needed for each ingredient. The store does not have things measured in cups. If you have not done this ahead of time be sure to bring a conversion table. It is highly recommended to do this ahead of time b/c it is very difficult to do the math in the store on every item. Storage Tote for keeping the left over food items and the above items for the next meeting. Notify members when you plan to shop so they can plan for time to prep food. Also let them know when you plan to be finished shopping so they can come and pick up their prep food from the hostess. Most of the chicken is cooked cut , shredded or sliced depending on recipes. Raw chicken is cut too if recipe requires. Ground beef is cooked with onion or taco seasoning as needed. Vegetables and fruits are cut. Cheese is grated (or just buy shredded cheese from Costco). Items are bagged and labeled. Try to make it even for all members, but give the hostess a little bit of a break because this is a big month for her. Prep work can take 1-2 hours, depending on the number of meals on the menu. Split meats up among members to utilize everyones CrockPot. Crock Pot is the BEST way to cook the chicken. Grilling chicken before shredding it often leaves the chicken a bit to dry! I was reviewing the section about freezer meals. 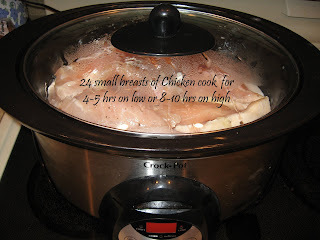 Included is a picture about using a crockpot to prepare chicken breasts ahead of time. The text on the picture reads, “24 small breasts of Chicken cook for 4-5 hrs on low or 8-10 hours on high.” Is the time right? It sounds backwards to me. Yikes! That should be the opposite. I am new to my community. 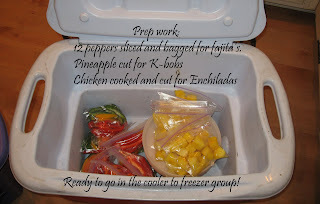 I heard of a missionary that would make freezer meals for her family. Do you have a “single family” ingredient, shopping list? Its me again, 2 years later. Life has changed tons for us. With 3 moves and now homeschooling teenagers! Anyway, way back when, you had a spreadsheet that had every ones recipe’s and ingredients, who has what and what was left to buy. I cant find the pop up for it anymore. Did it get moved or removed?